A corner of monochrome concrete to support weight. Manufactured by hand in Granby, Liverpool. Granby Workshop, 2015. Red and yellow brick, slate and stone are cast with sand, black pigmented cement and aggregate and then ground and polished, creating a highly decorative surface speckled with rubble. 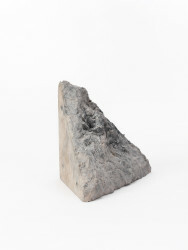 Bookend, Granby Workshop, 2015, Crafts Council Collection: 2016.11. Photo: Stokes Photo Ltd.
Bookend, Granby Collection, 2015, Crafts Council Collection: 2016.11. Photo: Stokes Photo Ltd.
Bookend, Granby Workshop, 2015, Crafts Council Collection: 2016.11 & 2016.12. Photo: Stokes Photo Ltd.